A scrap metal dealer has spoken about the moment a huge fireball erupted over his head when a hidden gas canister exploded at his yard. The fire in a yard run by WH Orchard and Son in Dobwalls, Cornwall, caused an estimated £10,000 of damage. Owner Graham Orchard said the fire started because a gas canister was left in a car they were crushing. Cornwall Fire service confirmed a gas canister was the "likely cause" of the fire. For more on the scrap fire and other stories across Cornwall. Multiple appliances from across the county were called to the scene at on Thursday afternoon. Relief crews stayed overnight. Reflecting on the cause of the fire, Mr Orchard said he was angry about the canister being left in the vehicle. "Somebody brought in the shell of a car and we asked them if there was anything hazardous in it, they said 'no', and we took their word for it," said Mr Orchard. "Because people are being charged now to get rid of different types of waste, they try and mix it in with the general scrap, to hide it, and then this is what happens. "We need to get the message across that it's dangerous to mix scrap metal, people don't understand the risk. "We've been in business 60 years, but that frightened me yesterday." 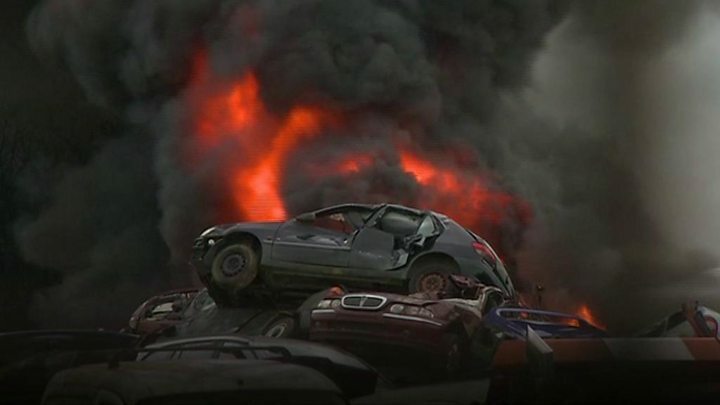 Image caption Cornwall Fire and Rescue Service used diggers to break up cars and get to "hot spots"